When someone is hurt as the direct result of a product, the manufacturer or other party involved in the distribution of the product can be held responsible. If you or a family member has been seriously injured by a defective product, contact the Rubinstein Law Group to schedule a free consultation with our defective product lawyer in Oceanside. When products are defective and do not include adequate warnings, serious injuries and death can occur. According to the Consumer Product Safety Commission (CPSC), there were an estimated 235,300 toy-related injuries treated in U.S. hospitals and 19 toy-related deaths in the United States in 2008. Prescription drugs are also responsible for injuries and death. The problem has become so prevalent that the U.S. Food and Drug Administration (FDA) has created a drug watch list that identifies certain drugs and the potential risks. These types of cases fall under the legal category of products liability law. California and federal laws exist to protect consumers from dangerous or defective products placed on the marketplace. To have a successful case, it is crucial that you work with a knowledgeable San Marcos product liability attorney who will be able to advise you on the best course of action. Manufacturers, designers, retailers and distributors can be held liable, but they will do everything in their power to prove that the product was not defective or dangerous. They know that if you win your case, it could cause more product liability lawsuits to follow from other consumers. An experienced defective product lawyer in Carlsbad will fight to protect your rights. The San Marcos personal injury attorneys at the Rubinstein Law Group have been representing injured victims for over 20 years. We know how difficult it can be to cope with a serious injury, which is why we will not only provide expert representation, but will also help you regain your dignity and sense of independence and self-worth. Our personal injury lawyers in Escondido only succeed if we are able to help our clients receive justice. We are consumers just like you and we know the importance of holding manufacturers and other liable parties responsible for endangering our lives and that of our family members. Our Oceanside product liability attorneys and experts work together as a team, which enables us to build a strong case and prepare for trial, if a settlement cannot be reached outside of court. As our client, you can call our office at any time and speak with a lawyer who knows the details of your case. 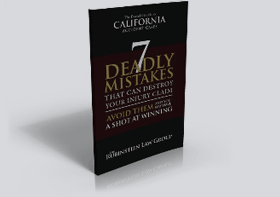 A successful products liability lawsuit requires thorough and extensive preparation. We frequently seek the opinions of experienced engineers to determine if and how negligence existed. Our law firm has represented defective products cases involving a wide range of products. It is crucial that you consult with a defective product lawyer in San Marcos immediately following an injury caused by a defective product, as adequate time will be needed to properly evaluate your case. Contact the Rubinstein Law Group at (760) 804-2790 today if you or a loved one has been harmed by a defective product. Our product liability attorney in Carlsbad can provide legal guidance for you.